St. Augustine Episcopal Chapel was founded by Lenora Evans Berry, an African American woman, in 1907. A lifelong Baptist, her mission was the development of the Episcopal Church for African Americans in Youngstown. Mrs. Berry's husband, bricklayer Thomas D. Berry, the son of master builder P. Ross Berry, became the church's first senior warden and treasurer. 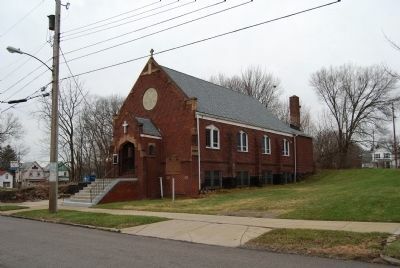 The congregation met in St. John's Parish until they were able to obtain property on Parmalee Avenue. In 1912, Reverend John Ogburn was officially called to vicar. In 1920, work began on plans for a new church. The structure was designed by Charles F. Owsley and construction began after more than six hundred individuals from the community attended the laying of the church's corner stone on September 11, 1921. 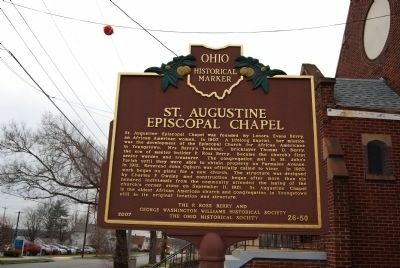 St. Augustine Chapel is the oldest African American church and congregation in Youngstown still in its original location and structure. marker is included in the Ohio Historical Society / The Ohio History Connection marker series. Location. 41° 6.906′ N, 80° 39.552′ W. Marker is in Youngstown, Ohio, in Mahoning County. Marker is on Parmalee Avenue 0.1 miles west of Belmont Avenue, on the right when traveling west. Touch for map. Marker is in this post office area: Youngstown OH 44510, United States of America. Touch for directions. Other nearby markers. At least 8 other markers are within 2 miles of this marker, measured as the crow flies. St. Elizabeth Hospital (approx. 0.2 miles away); Harry Burt and Good Humor / Ross Radio Company (approx. 0.9 miles away); Little Steel Strike (approx. one mile away); Warner Brothers (approx. one mile away); 1959-1975 The Vietnam War (approx. 1.1 miles away); Union National Bank Building / Central Square (1798-1899) (approx. 1.1 miles away); In Memory of the Heroes of the Township (approx. 1.2 miles away); Central Tower / Mahoning National Bank Building (approx. 1.2 miles away). Touch for a list and map of all markers in Youngstown. More. Search the internet for St. Augustine Episcopal Chapel. Credits. This page was last revised on June 16, 2016. This page originally submitted on December 8, 2014, by Mike Wintermantel of Pittsburgh, Pennsylvania. This page has been viewed 205 times since then and 5 times this year. Photos: 1, 2. submitted on December 8, 2014, by Mike Wintermantel of Pittsburgh, Pennsylvania.